The Probeware Lab Manual contains 15 probeware laboratory activities that are designed for a life science, Earth science, or physical science curriculum. 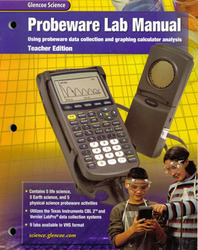 Each activity helps students explore scientific concepts using a probeware data collection system. These hand-held systems provide a fast and simple way to collect, view, and analyze data in the classroom or during a field investigation. Using various probes and sensors, students can measure temperature, light, voltage, conductivity, motion, pH, and more. Integrating technology in the classroom is made easy with step-by-step instructions for setting up and using the probeware. This teacher edition helps you set purpose, estimate time allotment, gives additional information about materials needed, and features safety information, teaching tips, extension suggestions for extending the learning experience, and pre-lab answers.